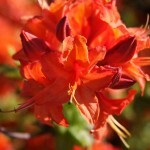 An upright rounded plant with ruffled, bright red-orange flowers that are lightly scented. The flowers occur before the foliage emerges. It is a mid-season bloomer with mildew resistant foliage. Great for mass planting or a bright accent in the early spring garden.